Read this page and still need help? Check out the Kodi for Android Kodi.tv support forum. Other OUYA-specific wiki pages for topics, guides, and advice. For everything else, standard Kodi pages will normally apply. OUYA's default OS is based on an older version of Android that can only run up to Kodi v14.2. To install Kodi v15 and higher users must replace the OUYA OS with a newer Android version using third party community firmware. For more information on this see HOW-TO:Install CyanogenMod on OUYA. Old how-to for Kodi v14.2: HOW-TO:Install Kodi on OUYA. Audio passthrough for some users will likely require SPMC, which is a modified version of Kodi. Wifi on the OUYA might not be enough for some high bitrate HD streams. In this case, using wired ethernet is recommended. Android, which OUYA's OS is based on, is limited right now to 60Hz. Those with media that plays back at 50Hz might see occasional stutter. Volume control does not adjust the volume level. It will mute the audio if volume is turned all the way down. If you want to open Kodi automatically when the OUYA boots up, you can choose between two applications, "BootyCall" or "Auto pilot", both are available on the OUYA store. BootyCall  ($2.99) - This application functions as a default launcher ensuring your chosen application, XBMC/Kodi in this case, is the first application loaded and also is returned to upon exiting other applications. Auto Pilot  (Free) - When installed the name will show up as "BOOT". Connecting the BlueTooth remote may close Kodi after, to avoid this issue, use an Kodi remote (Official, Yatse, etc...). Easy Infra red remote (no root): I figured the easiest way on getting IR is to use a cheap "PC Remote". The "PC Remote" receiver actually emulates a full keyboard based on infra red and starts at 5 USD (http://www.amazon.com/gp/offer-listing/B0050PUGZE/ref=dp_olp_new?ie=UTF8&condition=new). You can later swap this remote for a remote with learning capabilities, as the Sony RMVLZ620 (~25 USD), you learn the codes from the "PC Remote" and you get yourself an awesome IR solution that will keep working even if you get those pesky Ouya updates. OUYA Specific Addon Repo: You can find an OUYA specific repository of addons available, (Eldon's Kodi Repo). 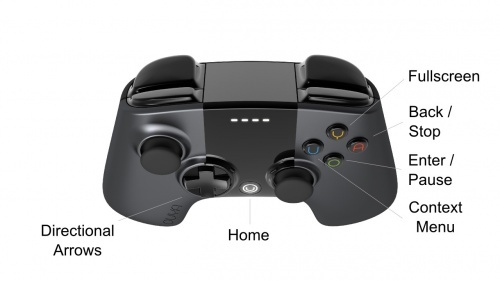 Some of the plugins are specific to the OUYA platform, while others will work on android devices in general. Android hardware - Other Android platform which Kodi supports hardware video decoding on. Android - Android operating system information in regards to Kodi usage. http://forum.xda-developers.com/showthread.php?t=2359390 - WonderEkin's mod/tweak collection - Install Google Play Store, Disable auto update, Switch 720p/1080p res, Overscan fix, etc. This page was last edited on 20 January 2016, at 00:01.